Months ago I planted an assortment of peppers - red, orange, green, and yellow bell peppers plus some sweet banana peppers. For months they didn't seem to be growing at all and looked as if they were dying. I shifted my focus to the passion fruits and beans, and all of a sudden I found peppers flowers blooming and peppers growing. I love this kind of surprise! It's like discovering treasures in the soil. Historically, my peppers never got big, and it's the same with eggplants. Perhaps I need to add more compost to the soil. This year even my tomatoes stay small. Fortunately, I am also growing gooseberries, and they are doing extremely well with lots of flowers. Please Check back for an update on the gooseberry plants! Yesterday I picked up a free book from a pile of garage sale leftover. 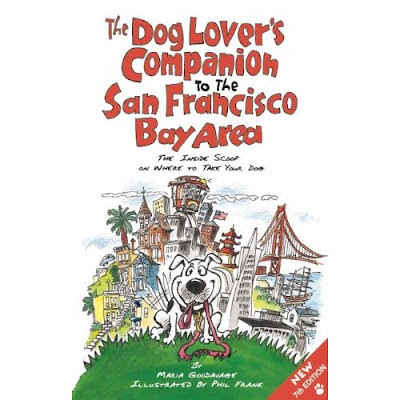 It's called The Dog Lover's Companion to the San Francisco Bay Area. I flipped through the book and found Sobrante Ridge Regional Preserve as the highest rated dog park in Contra Costa County. I thought Wildcat Canyon was really great. Can Sorante actually surpass Wildcat Canyon? I had to check it out for myself. This morning I packed up my regular hiking gear along with another jar of peachy smoothie and hit the road with Kelsey in the back. El Sorante isn't far from El Cerrito, but as I drove down San Pable Dam Road, I had the feeling of going back in time. I was hoping the weather would stay overcast since I consider that as the most ideal weather for hiking. Unfortunately, the sun came out shortly before 10 A.M. as I arrived Sobrante Ridge. I was surprised to find a completely empty parking lot and empty park. We saw a lot of lizards as we hiked up the hill. The temperature quickly became rather hot especially both Kelsey and I have dark hair. There is also very little shade in the open preserve. After hiking for 30 minutes, we took a water break under a big tree and then turned back. Compare Wildcat to Sorbante Ridge, I like Wildcat better for its varied scenery. At Sobrante Ridge, it seemed it was the same view endlessly - dirt road with dry grass taller than I on both sides with occasional trees. I saw just one person walking with his 2 dogs, who arrived after I did. I prefer to see a few more people when I go hiking, and Kelsey likes to see more dogs, too. Since I returned to the world of full time workers, I haven't had much time to spend in open space. Yesterday I decided to hike in a park that I discovered recently, Wildcat Canyon Park. I drove pass by the park over a month ago while on my way to a birthday party. A few days ago, a dog walker at Point Isabel mentioned to me that Wildcat Canyon is also good for walking dogs. Yesterday I looked into Kelsey's eyes and promise her that I'd take her out on a real hike. This morning I arrived at Wildcat before 10 a.m. I love reading historical facts of our regional parks. It's a little sad that most of these native wild animals are no longer here. In Alvarado Area of the park, there are many picnic sites and a children's playground. After encountering a few people walking with their dogs, one dog owner described to me various hiking trials with good views. I took one of his suggestions and went up the hill. Dogs need to be on leashes in populated area, but they don't have to once they are out in the open space as long as they listen to voice commands. As usual Kelsey walked close to me as we hiked up the hill to the top. We were able to make a loop coming back down and return to Alvarado picnic area. I brought a jar of peach smoothie and a sandwich with me. I gave Kelsey some water and shared small bits of ham with her while I ate my lunch. It was a pretty good two-hour outing. I felt that Kelsey and I had a pretty good workout. I plan on going there again soon. I was surprised to find whole ripe strawberries in my little strawberry patch that grew back from last year. I had long given up on growing strawberries due to squirrel bandits. However, this year I have Kelsey, who loves chasing after squirrels. I can now grow strawberries! I wish I had planted more this year. I also find a lot less partially eaten peaches on the ground this year. I am sure Kelsey has been busy chasing the squirrels away. It looks like in a few days I will need to start picking the peaches. The cherries also managed to ripe without being snatched by the squirrels. I picked all of them today and ate them right away. They were super sweet!